New and Improved Drain Maintainer is a true breakthrough in drain opener technology. With a pH of 13 and caustic formulation, this fast-acting product offers the performance of traditional caustic drain openers, but is biodegradable, non-irritating to skin, and ships DOT non-hazardous. Its high density, thickened formula is heavier than water, so it sinks and clings to the blockage and begins working quickly. 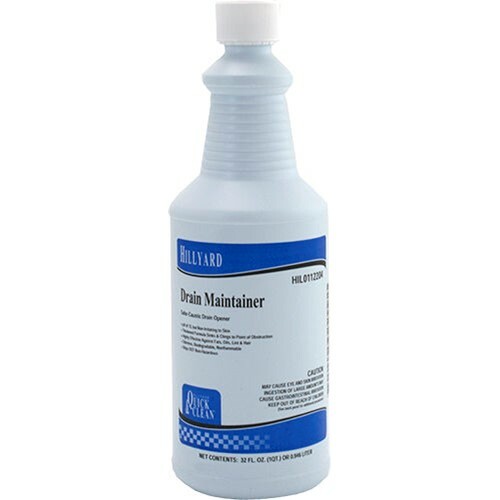 ?Highly effective against obstructions caused by fats, oils, lint and hair, Hillyard Drain Maintainer is odorless, nonflammable, and safer to use than traditional drain openers. pH of 13, but non-irritating to skin. Thickened formula clings to point of obstruction.